Telemarketing tips for all types of cold calls and callers at all levels of experience and ability. Whether you make telesales or marketing calls, on this page you'll find tips, techniques, and skills to boost your results or your teams. Developed and proven while working with professional cold callers. Used to train telephone sales skills to new starters with no experience. Help experienced people to keep over achieving targets. And to increase the performance of those struggling and in threat of losing their jobs. Whether you're an employed sales person or telemarketer, a self-employed service provider, or a small business owner, the proven sales training in this section will work for you. Below you'll see headings and a brief introduction to each topic. When you find a topic of interest follow the links and see the full pages of training and tips on that subject. 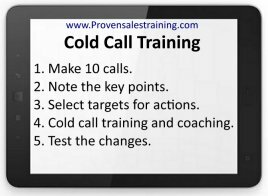 Whatever type of cold calls you make the telemarketing tips in this 5 step training process will work for you. You can use it to improve your own results or to train others. It will work for telesales calls, making sales appointments, and all types of telemarketing calls. How to prioritise the parts of your call to target with training. And how to find the best training for your individual needs. I've used this 5 step process to maintain the performance of top performers, and to give continuous and constant improvement to people new to cold calling and those struggling to hit targets. Where on the call you were stopped. What stopped you closing the sale or fulfilling the aim of your call. Once you've made the 10 calls you'll learn how to analyse what happened and define the key areas to target with training. 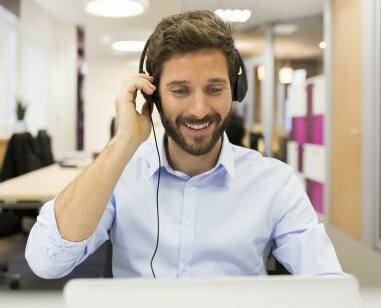 Telemarketing tips for small businesses on how to set targets and manage telesales and appointment setting activity to make sure you hit them. Set targets for new business revenue related to telemarketing. Professionally manage your telemarketing activity. Manage sales lead use and generation. Understand conversion rates of calls to sales or appointments. Make the best use of your valuable time and resources. Do you know how many sales leads your small business will need to achieve your sales targets or personal goals? What about the number of telesales or sales appointment calls you'll need to make. And how will you know when you've made enough? All this information will become easy for you to work out and use to professionally manage your telemarketing activity. 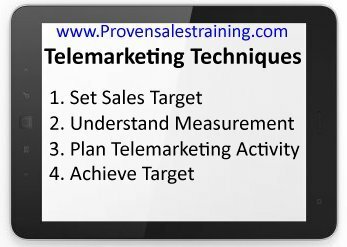 Effective telemarketing lead generation techniques to plan your telesales and appointment setting success. Calculating how many sales leads you will need each month. Where to get the leads from. Ways to generate incoming enquiries using simple online proven methods. Many sales people and telemarketers don't include acquiring new leads in their their planning and forecasting. Large companies send out fiels sales teams and expect them to do al their own lead generation. Small and medium sized businesses don't calculate how many leads they will need for making sales apointments and telesales calls. Telemarkting tips on how to keep motivated and enjoy cold calling even if you hate it now. Telesales and telemarketing can be a tough job. Making outbound calls can really test your resilience. You can face constant objections and rejections. If you're self-employed you're under pressure to make sales or find potential customers. Employed people can have managers pushing for better results. No wonder many people get burn-out or stress. 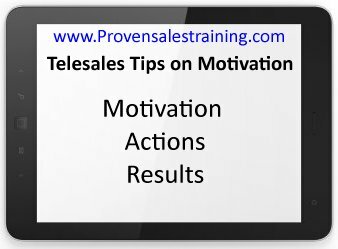 If you need a sales training technique to keep your motivation levels high, and help you to enjoy cold calling, you'll like this technique. It's based on turning your focus to getting a No from your prospects rather than just chasing Yes's all the time. You can't get a sale or achieve your goal on every call. What you can do is get a defined No when you can't get a Yes. A defined No is where you know exactly why the prospect you phoned stopped your call, raised an objection, or said No to your proposal. And from that defined No you can learn and make changes to your call. It's a similar technique to the 5 Step training and coaching process above but aimed a complete refocusing of how you frame your viewpoint of your calls. 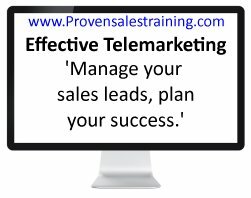 A proven professional training course to make cold calling for sales appointments easy and successful. Create your own sales appointment scripts with this proven training process. Your cold calls sound natural because you use your own words and phrases. You'll always know what to say becuase you use your scripts as guide to a conversation with your prospects. Follow a step by step guide to learn how to move prospects through the stages of the appointment setting process towards gaining agreement to meet with you. 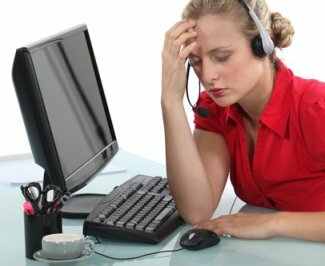 Telemarketing motivation techniques to make every outbound call vibrant and full of energy. Use your posture and physiology to keep you motivated through long cold calling sessions. Be aware of when you're slipping down into a mind-set that impacts on how your calls sound. See telemarketing tips on how to avoid sounding like you're caling from a call centre. Click through to this page and you'll get two motivational techniques to make every call you make sound great. These two techniques combine to keep you at the top of your game and able to use all your skills and experience on all your calls, no matter how long you're calling session is. 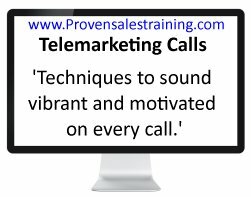 The techniques have been proven to work in call centres and can be used for anyone that makes telemarketing calls,. Self employed and small business owners, sales people making their own appointments, and telesales working in call centres. A two step technique for instant self-motivation that gives you the ability to motivate yourself on demand. When you're motivated you look for positive actions that will generate great results. Great results lead to greater motivation and the circle continues on an upward spiral. These telemarketing tips kick off the process by taking you from a point of low level motivation and resilience to a state where you want to achieve your personal goals. Using advanced peak performance training you'll learn how to turn on your motivation at will and get in the right frame of mind to make telesales and telemarketing calls.